Why Sweese 10 oz bowl set? 1. For daily use - It's perfect for pudding, fruit in the morning, small side dishes with dinner, ice cream dessert after dinner, you can also use them for meal prep, for the baby's meals, for serving sauces, dips, and condiments. 2. A healthier portion size - These small white bowls helps adults to use smaller portions and not over-eat. Love the ice cream, but i need to limit myself to it, how? Use this little bowls, enjoy your delicious food without worrying over-eat. 3. For your pets - The size is perfect for cats or small dogs. Plastic dishes can give your cats acne under their chin which is painful and ugly. You will never had this problem with the Sweese bowls. Add the Sweese Porcelain Small Serving Bowls to your cart now! PRACTICAL HANDY BOWLS FOR KIDS AND PETS - It holds 10 oz top to the rim. Perfect for ice cream, dessert, fruit, meal prep, small snacks, dipping sauces, leftovers and more. They are just the right size for kids little hands which make them easy to hold, also great for pets as they are relatively shallow and easy for your cats/dogs to get their faces into. MODERN LOOK WITH CURVE SHAPED DESIGN - This Sweese curve collection bowls has a stylish shape with clean and curved lines, which adds a modern touch on your table. 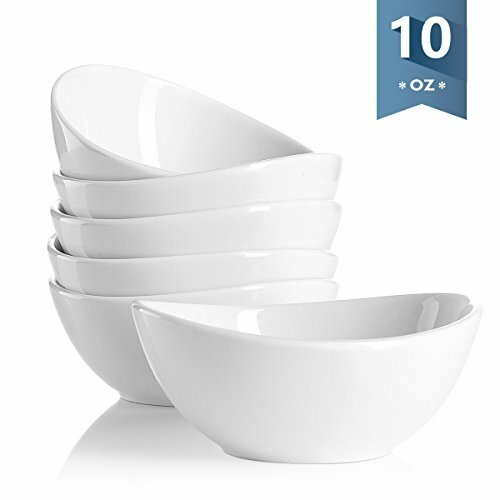 You won't get out of the conventional round bowls until you discover this curve collection. It matches well with your other Sweese set. EASILY STACKABLE & EASY TO CLEAN - These Sweese bowls stack well and take up little space in the kitchen cupboard. They clean up perfectly in the dishwasher as well, alternatively, you can wash them easily with soap and hot water.